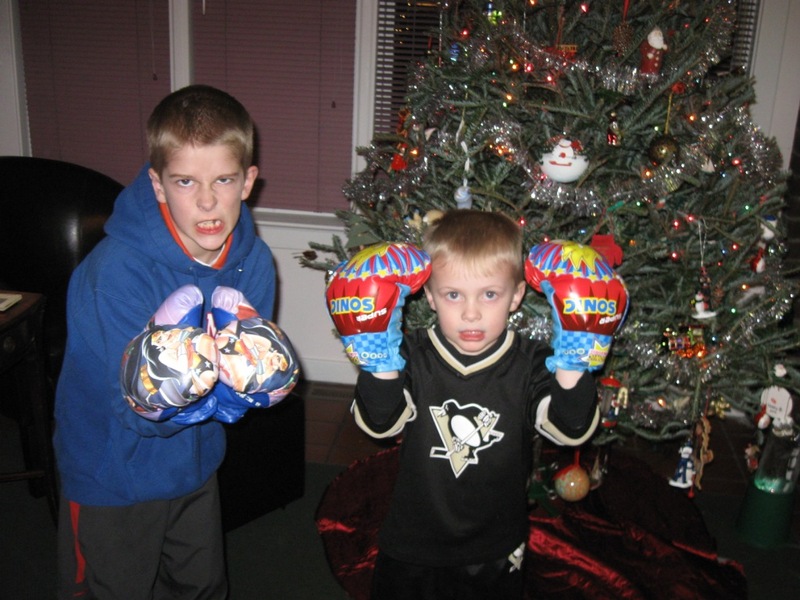 A gift I received as a child morphed into an adulthood joke: My uncle Bob bought my brother and me boxing gloves for Christmas when we were about eight. Boxing gloves! Can you believe it? This year, we opened a box of gifts from my wife's aunt Becc a, and there were similarly-sized packages for each boy. 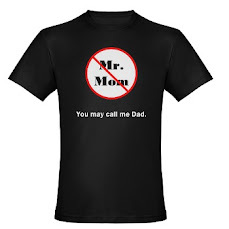 The wacky spirit of violence as a generational gift returned. 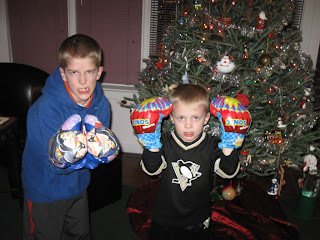 Whereas my gloves looked authentic and had a replica Marvin Hagler autograph on them, the boys' gloves were emblazoned with Sonic the Hedgehog and some other cartoon character. They liked them a lot, and they boxed with some frequency for a few days. We already had an established rule that screaming and crying gets them separated, so we implemented that a few times. Although I'd joked about the boxing gloves, the memories of my brother and I slugging it out in our low-ceilinged basement with the sharp-edged, foot-high, stone hearth running the width of the room wigged me out. We pummeled each other in what feels now (and sometimes felt then) like a frightful way. Being twins meant that we were in the exact same weight class with identical reach; we were too closely matched for safety. We established a weird ritual in which the winner of the boxing match had to go upstairs and run a bath for the vanquished loser. Flash back to this Christmas. When friends with a three-year-old came over for New Year's Eve and our four-year-old promptly punched him in the stomach "to show him how strong the gloves are", we decided they had to go. When we later told the boys in the car that we weren't keeping the gloves, they both burst into tears and leaned across the gap between their booster seats to hug each other. Happily, within a day or so, they'd pretty much forgotten the whole affair. The gloves did not go to a landfill. A friend who does therapy with kids took them for some of her young clients who need to work out their anger issues. She wants to find a heavy bag. This seems like a good outcome and one that skips the middleman. This way, it won't be our kids going to a therapist in their early twenties saying "My great aunt gave us boxing gloves, and my parents let us beat the crap out of each other in the basement." "When we later told the boys in the car that we weren't keeping the gloves, they both burst into tears and leaned across the gap between their booster seats to hug each other." HAHAHAHAHAHAHAHAHAHAHA! My brother gave my then 4 year old daughter a water gun that looked like a real gun for her birthday. I had to donate that one because I couldn't regift it to anyone. We also got Tattoo Barbie from someone.